‘Gradually we drop down to the Erme, and not far south of the point where the Redlake joins that river shall discover Erme Pound, a circular enclosure of rough granite, formerly the South Quarter enclosure for estrays.’, (Page, 1895, p.256). Erme Pound, the name sounds as if it is the currency of a small British dependency located at some far flung corner of the Empire. In fact it is part of what was a series of prehistoric settlements known as Erme Pound Rings which in turn may well have been the ‘des. res.’ of its time. As noted above, both settlements and pound take their names from the nearby River Erme which flows past the western side of the complex. Originally and locally the river is known as the ‘Arme‘ but the earliest record of the name can be found in the Buckfast Cartulary of 1240 when it was ‘Irym‘. Since then it has been documented as Hyrm (1281), Irm (1346), Irum (1354), and even Arme Haven (1550), (Gover et al. 1992, p.4). ‘It was formerly used for the purpose of penning cattle in, found pastured on the moor by those who had not the right so to do, at the time of the drifts… Careful examination made of it many years ago led me to believe that it is constructed on the site of a more ancient enclosure – that of a hut settlement… There can be no doubt that the wall is raised upon what once formed the foundations of a rude vallum… The pound is of an irregular shape, though somewhat approaching a circular form, and the measurements I have taken of it show it to be 345yd in circumference… The entrance to the pound is on the southern side, and consists of a wide gateway. Immediately outside this gateway are the remains of a very curious building, and lower down, but close to the wall of the pound, the ruins of another of similar size, but of different arrangement. In shape they resemble the oblong buildings which I have mentioned as being frequently found on or near the site of old mining operations… it is by no means improbable that they were constructed as places of shelter for those who visited the pound at the time of the drifts… The hut which so closely joins the gateway has a stone bench running almost entirely around the interior forming a seat capable of accommodating a number of persons...’, (Crossing, 1974, pp. 76 -78). If you take Erme Pound as a whole it consists of three segments (A, B and C on the plan), It appears that the areas ‘A’ and ‘B’ were at one time dived by a wall which is now buried. In section ‘A’ there are the remians of two huts and courts, the enclosed area is devoid of much surface stone which could well indicate that this was an area used for cultivating crops. Area ‘B’ demonstrates a different use as it contains several courts located around the edge of the wall. Along with these is evidence of about 17 small circular structures which probably were storehouses of some kind, there are just two buildings large enough to have served as dwellings. The northern section (marked ‘C’ on the plan) of Erme Pound Rings is where the actual dwellings were located, today there are visible remains of at least 6 huts located in the centre of the enclosure. It is this area that was used as the later historic pound and so has suffered a large degree of alteration and damage which could well have meant the loss of other hut circles. Entry to this area would have been through a gateway located in the southern wall of the enclosure, just outside this is one of the oblong structures which the drovers used, (Butler, 1993, pp. 72 – 74). There have been several methods of estimating the Bronze Age population from the known hut circles, one of the earliest was suggested by Sabine Baring Gould, he considered that: ‘If we give an average of twenty huts to a pound, and allow for habitations scattered about, not inclosed in a pound, and give six persons to a hut...’, (Baring Gould, 1982, p.48). As there are 11 known hut circles within Erme Pound this would suggest a population of 66 people living at the settlement. A later method of estimation is that in the larger huts of over 7m diameter it would be possible to accommodate four adults thus giving them 10 square metres of space each. Anything below this size probably was designed for two adults to live comfortably, ((Butler, pp.140 – 1). There does not appear to be any hut circle with a diameter of over 6 metres at Erme Pound which according to Butler’s idea offers a population of 22 adults, this would a more accurate estimate than Baring Gould’s figure of 66 people. Prior to 1404 all stray animals (estrays) that were caught in the various drifts were impounded at Dunnabridge Pound where on paying a fine the owners could reclaim their livestock. At this time the Forest of Dartmoor was divided into three ‘quarters’ for the purposes of leasing out the land but in 1404 a fourth ‘quarter’ was added which when the distance of Dunnabridge is considered would necessitate a new pound located in this new quarter – hence Erme Pound. Numerous writers cite an entry in the Lydford Court Rolls of the 1500s which mentions that Thomas Rawle and John Beare paid 1½ pence for an acre of land, ‘next Erme Pound and Luytock Bewest‘, (Butler, 1993, p.74). From this we can be sure that there was a ‘pound’ located at Erme Pound Rings and so can surmise that the prehistoric pound was ‘enhanced’ to form an enclosure for livestock between the early 1400s and 1500s. Crossing mentions that he had: ‘been told by a moorman how it used to be related that broken jars and bottles of an antiquated shape were to be found at Erme Pound, particularly in and around the little house near its gate‘, (Crossing, 1994, p.104). ‘Erme Pounds constitute another complex group, and provide important evidence which enables them to be placed as of later than Bronze Age. For, of the four enclosures, the most southerly interrupts a stone row leading to a burial kist. Evidently, therefore, this enclosure at least was constructed by a people, probably earlier in the Earlier Iron Age, to whom the religious significance of the stone rows and cairns meant nothing.’, (1953, p.146). Despite the bracken growth, both the stone row, kist and pound wall alluded to above can be picked out on an aerial photograph of today. The idea that the pound and its associated huts completely disrespects the row and burial kist is clear to its sacrilegious proximity to the ritual monument. This phenomenon is by no far means exclusive to Erme Pound Rings and can be seen at other Bronze Age settlement sites such as that at Hurston Ridge to name but one example. In other words, whatever force these people were trusting with their well-being and prosperity seemed to have, for whatever reason, suddenly forsaken them. Possibly their crops were failing, the climate deteriorated and people began to starve, all factors that would make a person of the age think their gods had either deserted them or taken offence with them. Unbeknown to them what had actually happened was that the land they had been farming so intensively had become exhausted and unable to produce sufficient crops, this tied together with a deteriorating climate would have led to crop failures and then starvation. This in turn would have led to competition for what productive land was left and maybe what food supplies there were became a resource worth fighting for which resulted in the ‘chaos‘ mentioned above. Faced with such dire and incomprehensible circumstances is it any wonder that the people turned their backs on whatever religious beliefs they had along with every monument and symbol of that faith? So dramatic was this happening that Palmer considers (2002, p.42) that, ‘The effect of the collapse of the faith in and around the stone circles was apparently so devastating that for some 500 to 600 years there is no sign of any belief system, sacred sites or even burials in Britain.’ To reinforce this idea he then cites the following from Hutton: ‘In the British Isles, the late Bronze Age, from 1100 to c. 600 BC is a period apparently entirely destitute of ceremonial monuments and almost without burials of any kind… It seems that the British and Irish had simply turned their backs upon the old sacred monuments and perhaps upon the old sacred ways.’. If this was the case then all the stone rows and circles on Dartmoor would have been superfluous to requirements and held no sacred purpose and therefore were fair game for building alongside or being dismantled and the stones ‘recycled’. 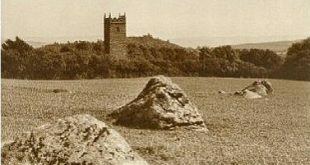 Although maybe in some circumstances there was still a modicum of some deep-rooted respect for the old monuments and what they stood for because they were never completely removed as is evident at Erme Pound Rings? Baring Gould, S. 1982. A Book of Dartmoor, London: Methuen & Co.
Butler, J. 1997 Dartmoor Atlas of Antiquities – Vol. V, Exeter: Devon Books. .Butler, J. 1993. Dartmoor Atlas of Antiquities – Vol. IV, Exeter: Devon Books. Crossing, W. 1994. Echoes of an Ancient Forest: Liverton: Forest Publishing. Crossing, W. 1974. Amid Devonia’s Alps, Newton Abbot: David & Charles. Page, J. Ll. W. 1985. An Exploration of Dartmoor, London: Sealy & Co..
Palmer, M. 2002. The Sacred History of Britain, London Judy Piatkus (Publishing) Ltd.